Back to school recipe treats are some of my favorite but the season just isn’t long enough to make them all! 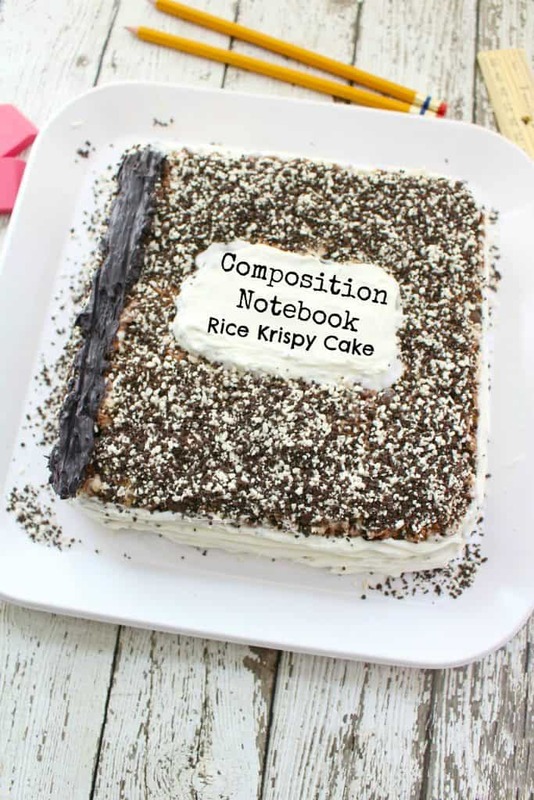 We’ve got some FABULOUS back to school themed recipe ideas (ABC Sugar Cookies, Apple Cupcakes) but this Composition Notebook rice krispy recipe just takes the cake! It is a guaranteed hit and surprisingly easy to make! This recipe will yield a 9 x 9 pan. Double it if you want a larger pan. 1. Line a 9×9 pan with foil and spray with Pam. Set aside. 2. In a large sauce pan, melt the butter over low heat. 3. And the marshmallows to the melted butter, stirring constantly. 4. Once marshmallows are melted, remove from heat and stir in the cereal and salt until well-coated. 5. Using a rubber spatula, transfer the Rice Krispies mixture to prepared pan and press down firmly. 6. Cool completely in pan. 7. With a spatula or butter knife, loosen the Rice Krispies from the pan. Invert the Rice Krispies onto a plate. 8. Frost all 4 sides with vanilla ready to spread icing. Use the prongs of a fork to make ridges to resemble the “pages” of the notebook. 9. Microwave 1/4 cup of Wilton black candy melts for 40 seconds. Stir until completely melted. 10. 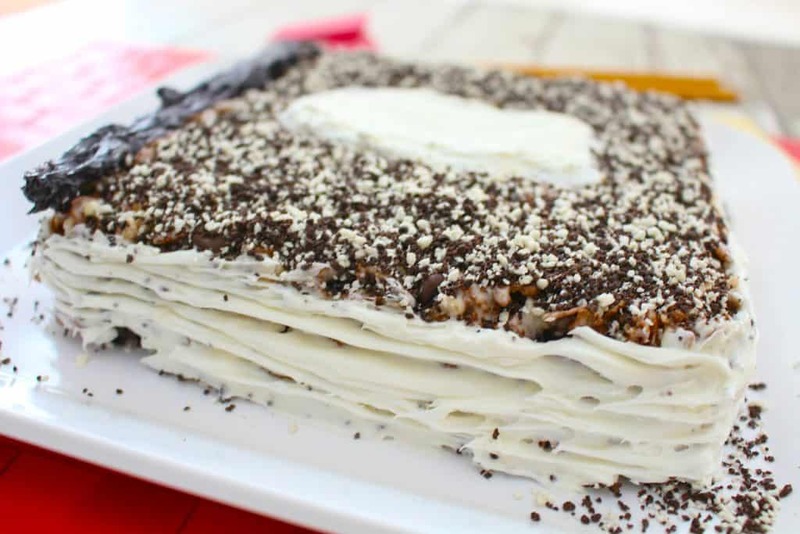 Drizzle the black icing onto the left side of the “notebook” and use a butter knife or small spatula to even out. 11. Sprinkle the Wilton cookies and creme sprinkles on top. They will stick on the Rice Krispies because of the marshmallows. 12. Sprinkle the cookies and creme sprinkles all over the left side (on top of the white icing). 13. Microwave 1/2 cup Wilton white candy melt for 40 seconds. Stir until completely melted. 14. Add the white icing to the middle of the top of the “book” in a rectangular shape. Let dry for 15 minutes. 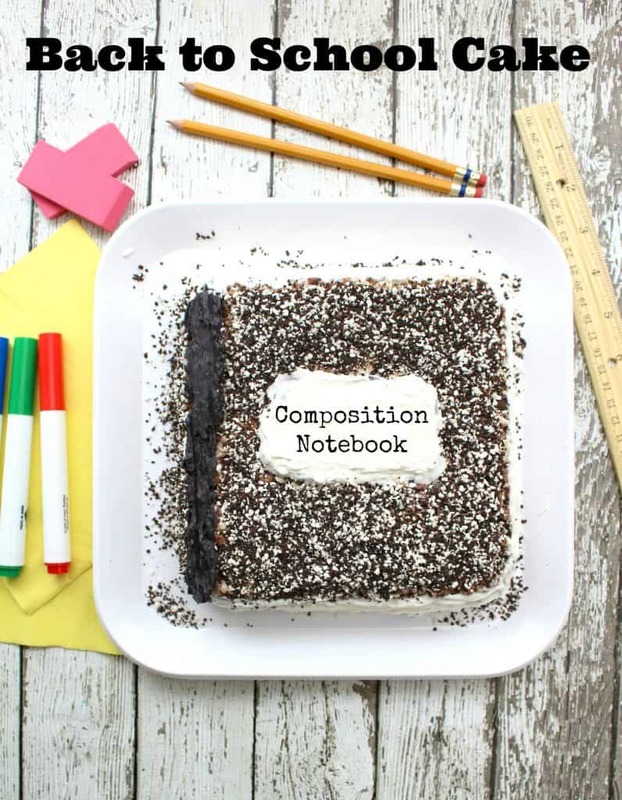 This FANTASTIC composition book cake back to school recipe gives a HUGE WOW factor once it’s all put together and decorated!